Even the humble eggplant, which doesn't seem as season-sensitive as tomatoes, are at their peak in the fall. In Japan, there's a saying, akinasu yome ni kuwasuna which means "Don't let the daughter-in-law eat fall eggplants". There are two theories to where that saying came from: one is that eggplants are so delicious at this time of year that the poor daughter-in-law shouldn't be allowed to partake. The other theory is that eggplants are considered to be "cooling" vegetables, and women who want to become pregnant should not eat food that cools the body. In any case, fresh, tender eggplant that isn't over-mature and full of hard seeds is really delicious. 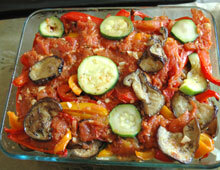 A really great ratatouille is not a vegetable stew, as some cookbooks say - it's more like a vegetable casserole. Each vegetable is pre-cooked, then brought together for the final simmering. Because of the preparation involved, making a proper ratatouille takes about 3 1/2 hours from start to finish, making it a great weekend project. Get the freshest ingredients you can in the morning, and put them together as ratatouille in the afternoon, to eat for dinner or for lunch the next day. The smells that fill the house while you're cooking this are irresistible. This recipe has the traditional Provençal flavorings of thyme and oregano, but you can also give it all kinds of twists, some of which I've described in the variations. Ratatouille is very versatile. It can be a condiment, a side dish, a pasta sauce, or even a sandwich filling. 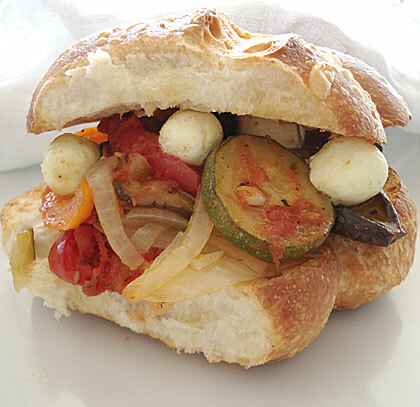 Here I have made a ratatouille sandwich with brebis, a kind of fresh sheep's milk cheese. Goat's cheese also works very well. My version of ratatouille is a bit less oily than some other recipes, since I pre-salt three of the vegetables to expel some of the moisture before cooking. I also pre-roast the eggplant and the peppers instead of sautéing them. This has another benefit - while those two vegetables are cooking in the oven, I have the stovetop free to deal with the three others. There are a lot of steps to follow, but it's not technically challenging to do. This is the easiest amount to make for me since I don't have a very large kitchen. It makes about 5-6 cups of ratatouille. You can double the amount if you want to - I wouldn't make less, since it seems a bit pointless to put so much effort and time into making a tiny portion. (Ratatouille will last in the refrigerator for at least a week, and freezes pretty well too.) The point is to have an equal amount, in weight, not volume, of the five vegetables. I've given approximate volume amounts in case you don't have a kitchen scale and want to eyeball it. Fill the pot/pan with water and bring to a boil. If you have very large eggplants, cut it into half or quarters lengthwise. Slice about 1/2cm - 1/8th inch thick. Put into a bowl, and sprinkle with a little salt all over. Toss. Slice the zucchini to the same thickness, more or less, as the eggplant. Put into another bowl, sprinkle with a little salt and toss. Slice the onions very thinly. Put into yet another bowl, and sprinkle with a little salt all over. Toss. Leave all of the above vegetables about 20 minutes. Put the tomatoes whole into the boiling water. Take them out after about 40 seconds. Peel off the skins, halve and scoop out the seeds. Chop roughly and weigh them. De-seed and slice the peppers. Spread on a paper-lined baking sheet. Sprinkle with a little olive oil. Prepare another baking sheet with paper, for the eggplant. Peel and then chop the garlic very finely. Drain the eggplant. Take handfuls at a time into a clean kitchen towel or several layers of paper towels, and squeeze out the moisture. Spread on the other baking sheet that you've prepared, and sprinkle with a little olive oil. Drain and squeeze the zucchini and the onions in the same way as the eggplant. Heat up your sauté pan or wok with a little olive oil. Fry the zucchini in the oil until lightly browned. Remove. Add the onion to the pan (plus a little more oil if needed), and sauté until limp and translucent. Remove. Put in the garlic, and sauté briefly. Add the tomato pulp, and break it up with a spatula. Add the bay leaves, thyme, oregano, and freshly ground pepper. (No salt -remember you've already used quite a lot to draw out the water in the vegetables.) Simmer for about 10 minutes over medium-high heat. Take out the bay leaves. Cover the casserole dish loosely with foil, and place on a baking sheet. Bake for about 20 minutes at the same temperature (180°C / 350°F). Take the foil off, and make a flat ball out of it. Carefully put it under one corner of the casserole dish, to tilt it up slightly. Make a dent in the opposing corner. It will quickly fill up with liquid. Take that liquid with a spoon or a turkey baster, and baste the vegetables (meaning, pour the liquid back over the top of everything). Put the dish and baking sheet back in the oven. Continue baking and basting every 15-20 minutes until the liquid is has reduced down to less than half of what you started out with. This may take an hour or more, depending on how juicy your vegetables were. A glass casserole dish makes it easy to see how much liquid there is. If the top starts to get too brown, put a piece of foil loosely over it. This basting and reducing is the most tedious part of the whole process, but it really helps to concentrate the flavors. Take out of the oven. Carefully tilt the dish and pour off as much remaining liquid as you can. Put the liquid into a small pan and reduce over a high heat, stirring, until it's syrupy. Pour back over the vegetables. Let stand for at least 20 minutes before serving. It's also delicious at room temperature or chilled. 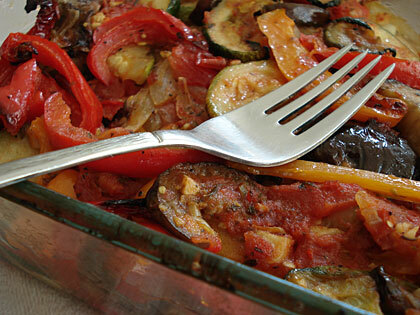 Asian-flavor ratatouille: omit the thyme, oregano and bay leaves. Add a piece of ginger when you sauté the garlic. Season with a little soy sauce, and sesame seed oil. Alternatively, add about 1/3 of miso loosened up with some hot water to the tomato mixture before assembling for baking. Make some small round croutons from a slice baguette by spreading them on a baking sheet and sprinkling with oil. Serve the croutons with the ratatouille. Serve with rice - either plain or a pilaf. For the ratatouille and brebis or chevre sandwich, halve a crusty loaf, sprinkle the cut sides with olive oil, and toast or grill. Pour a couple of tablespoons of any liquid that you can scoop up from the ratatouille onto the bread. 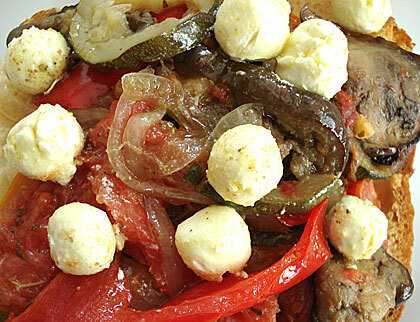 Pile on the ratatouille (room temperature is best), and add some pieces of cheese. (The one I used here came in little balls.) You can grill this if you like at this point, or just have as-is. You can also press it into a panini. To bring to work or on a picnic, press together well and wrap tightly in wax paper. The ratatouille flavor will have penetrated the bread nicely by lunchtime. Submitted by maki on 2006-09-22 16:18. I've started just baking the whole dish-saves alot of time and I love that flavor baking gives to all of the veggies involved. What do you do if you don't get any liquid?